The following is a blend of two recipes, one from Harumi’s Japanese Home Cooking (review) & the other from Let’s Cook Japanese Food! , a solid, bubbly intro to Japanese cooking. 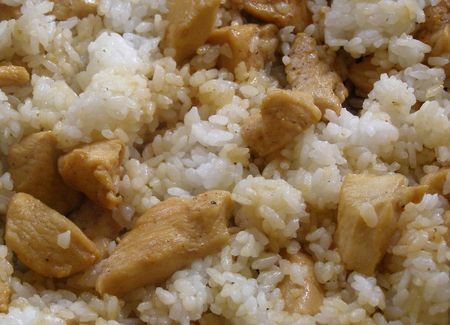 So you know, these are not verbatim write-ups: I modified the chicken teriyaki recipe, and condensed the rice instructions. Heat oil in a thick-bottomed pan over medium high heat. I used sesame oil, but the original recommends vegetable. Cut chicken breasts into thumb-size chunks, eliminating any gristle. Salt and pepper the chicken, then add to the pan. Brown the chicken on both sides until cooked through. Add teriyaki sauce in spoonfuls, until the chicken is coated, but not drowning (about half). Let cook, stirring occasionally, until the sauce has thickened into a nice glaze (about 1 minute). Remove from heat. 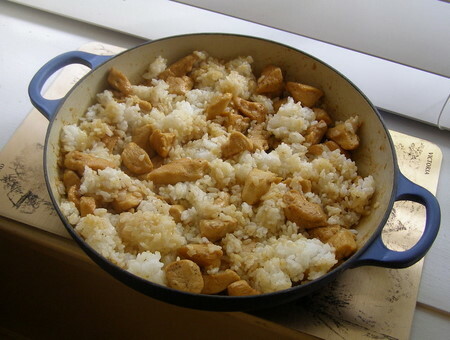 Let the pan cool for a few minutes, then add the cooked rice & gently mix with the chicken. Season rice with leftover teriyaki sauce as desired & serve. Put the mirin in a sauce pan on medium-low heat for about 2 minutes. Then add soy sauce & sugar. Mix well and leave on low heat until ready to use. *I used Morita ryorishu mirin & Kikkoman’s all purpose soy sauce. I used Tamanishiki rice (available at Amazon). It’s a koshihikari blend; I didn’t realize how delicious rice could be until I tried it. Any short-grain rice, though, will be good. About proportions: always add 1/4 cup more water than rice. So for 2 cups of cooked rice, you’d use 1 cup uncooked rice & 1 1/4 cups water. Before you cook the rice, wash it. Place the rice in a bowl in the sink. Add water, massage the grains, pour off the cloudy water & then repeat (here’s a video). Do this until the water is almost clear, or about five minutes. Drain well. Put the rice & measured water in a sauce pan, cover with a lid, then place over high heat. Do not remove the lid (this is important). When water starts to foam (the lid will start to jump & rattle), reduce heat to low and cook for 15 minutes. After 15 minutes, take rice off heat, and leave with the lid on for 15 minutes more. Serve.